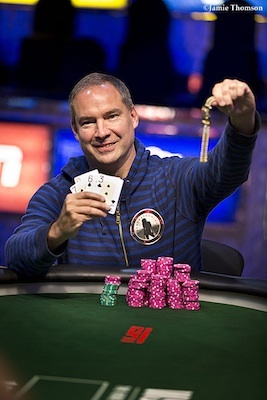 Two more bracelets were claimed last night at the 2014 World Series of Poker including Ted Forrest winning his sixth career WSOP title after coming from behind to defeat all-time bracelet leader Phil Hellmuth’s quest for a record-extending 14th bracelet in Event #7: $1,500 Seven-Card Razz. Alex Bolotin also earned gold after topping a field of 948 in Event #6: $1,500 No-Limit Hold’em Shootout, a first career bracelet for the Brooklyn-based player from Belarus after having accumulated two dozen career cashes at the WSOP. Three other events were in action on Sunday as well, but most of the focus was on the Forrest-Hellmuth heads-up clash that featured two players vying for second career WSOP bracelets in razz events, with Forrest’s win making him one of just 13 players ever to win six or more WSOP titles. Bolotin’s Event #6 victory came first last night after he managed to outlast the final 12 players who had survived two days’ worth of shootout tables to make yesterday’s third and final day. Bolotin had come close before, including a runner-up finish in a $5,000 NLHE 6-Max. event in 2007. He’d also won a non-bracelet event at the WSOP in 2009 in the Ante Up for Africa Charity Event. Here, though, the top-earning tournament player from Belarus broke through to earn his first WSOP win and add $259,211 to his career earnings. After the early eliminations of Jared Jaffee (12th), Steven Geralis (11th), and Colin York (10th) — each of whom earned $14,615 — it was eventual runner-up and 2013 PokerStars Caribbean Adventure Main Event champion Dimitar Danchev leading the counts to begin the official final table. Bolotin began the final nine third in chips, and besides Danchev had to contend with three WSOP bracelet holders among his opponents in Steven Loube, Shawn Busse, and two-time winner Josh Arieh. It was against Arieh during four-handed play that Bolotin won a crucial and most fortunate hand that saw the pair get all of Bolotin’s chips in on a flop with Bolotin holding and Arieh having hit a set with . But the fell on the turn, and after the river blanked Bolotin went from near-elimination to the chip lead. 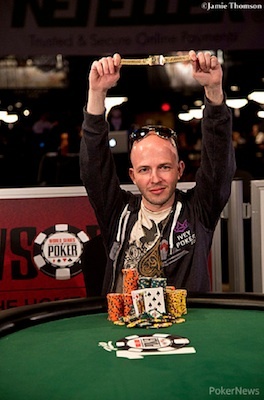 Bolotin soon knocked out Arieh in fourth, then a while later Danchev eliminated Jon Lane in third to set up an 87-hand heads-up battle in which Bolotin began with the chip lead then whittled Danchev down before finally winning after flopping topping pair then calling a river bluff by Danchev. So said WSOP Media Director to Nolan Dalla to commentator David Tuchman late last night on the live stream of the Event #7 final table as he remarked on both the crowd gathered around the main stage in the Amazon Room in the Rio All-Suite Hotel and Casino and those watching online. Indeed, while razz isn’t typically a crowd favorite, the prospect of seeing WSOP history being made was too irresistible for many to pass up. After telling PokerNews just over a week ago of his plans to win 11 more WSOP bracelets to reach a career total of 24, Phil Hellmuth came oh-so-close to grabbing one last night after he and Ted Forrest outlasted a tough final table that included other bracelet winners in David Bach, Brock Parker, and Brandon Cantu. 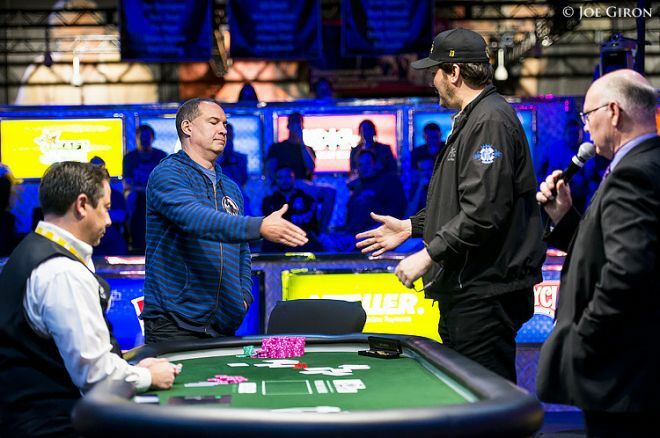 Emerging from a field of 352, Hellmuth was making his 101st WSOP cash and 50th WSOP final table — both records — and incredibly would add a 10th runner-up finish in a WSOP event to his 13 wins. After Greg Pappas was eliminated in third, Hellmuth had about a 2-to-1 chip lead to start heads-up play. But Forrest worked his way back to even the match and the pair fought back and forth into the night for five hours (including a dinner break) before Forrest eventually claimed the last of Hellmuth’s stack. It had been 10 years since Forrest’s last bracelet win who won two events in 2004 and three in 1993, including a razz title. Hellmuth, as mentioned, has a WSOP razz title as well among his 13, having won the $2,500 razz event in 2012. Event #8: $1,500 Millionaire Maker No-Limit Hold’em saw an amazing 7,977 entries on Saturday, with 1,466 survivors returning for Day 2 on Sunday. In just two-and-a-half hours more than 600 had been eliminated and they’d reached the top 819 and the bursting of the money bubble. From there the knockouts continued the same rapid pace until play concluded with just 178 surviving to today’s Day 3. Yuliyan Kolev and Jonathan Dimmig ended the night tied for the chip lead with 632,000 apiece, with Chris Demaci, James Mackey, and Curt Kohlberg among those returning to big stacks today. Everyone continues to eye the six-figure-or-better payouts awaiting the top 12 finishers and that tantalizing $1,319,587 first prize awaiting the Event #8 winner. Another big field came out on Sunday for the next low buy-in, no-limit hold’em event on the schedule, with 1,940 taking part in Event #9: $1,000 No-Limit Hold’em. The top 198 finishers are splitting a prize pool of $1,746,000 in this event, and they were able to race all of the way to the cash and then some last night as just 161 players were left to bag chips at night’s end. Adam Geyer bagged the most of them — by a long shot — having accumulated 177,500 during Day 1 while the chase pack hovers just below the 100,000-chip mark. Chris Hunichen, Keven Stammen, and Vinny Pahuja are among that group at the top of the overnight counts, with Mark Radoja, Thiago Nishijima, and Faraz Jaka not too far behind entering today’s second day of play. Finally the next of the $10K “Championship” events kicked off late yesterday afternoon with Event #10: $10,000 Limit Omaha Hi-Low. As should be the pattern in these $10K events all summer, the field for Event #10 was small but full of elite players, making it no surprise to find a number of familiar names among the leaders heading into today’s Day 2, with Dan Kelly sitting out in front as he seeks his second career WSOP bracelet. There were 178 entries in Event #10, with 111 making it through to Monday. Just 18 will make the money and divide the $1,673,200 prize pool, $443,407 of which is scheduled to go to the winner. The top 10 features numerous familiar names (see below), with Daniel Negreanu hovering just outside of that group in 11th position and Nick Schulman and Scott Clements close as well.